With a degree in English Literature and an Advanced Diploma in Business Administration, Alex became a freelance business writer for seven years. After seeing the shockingly positive impact of medical marijuana on a close member of his family, Alex took an interest in writing about cannabis. He soon shifted his focus to cannabis content, of which he has been writing for the past three years. THC drops are one the simplest and most popular cannabis edibles. They also happen to be one of the oldest forms of marijuana, dating back thousands of years – although they’re more refined today. Demand for these products makes them a staple for medical and recreational providers alike. While they may not be perfect, anyone looking for a great smoke-free option should definitely give drops a try. iDWeeds does NOT sell THC products. We compare products from trusted brands to present you results based on strength, price / value, and user satisfaction. As the cannabis market is flooded with shady scam sites, avoid disappointment and the risk of a contaminated product. After selecting the tetrahydrocannabinol product that suits your needs, you will be redirected to the desired page where you can place an order and check out. If you purchase a product from one of these links, we may receive a percentage of sales. Our existence depends on your support so we can provide free content and remain ads free. See our full disclosure notice. The cannabis oil comes packaged and ready for easy-use dosage in The Patron Eos-Dispenser. THC drops are oils infused with THC. The cannabinoids and – ideally – terpenes are suspended in a “carrier,” such as medium-chain triglycerides (MCT) or coconut oil. Like most edibles, they pass through the digestive system in order to take effect. The onset takes anywhere from 30 minutes to four hours, depending on different variables. Stomach contents, THC strength, and the volume ingested all determine how quickly the effect will hit. One great thing about THC drops is that they are easy to produce and safe to use. In fact, people can make their own drops at home, albeit with less refinement than industrial-grade products sold in Canadian dispensaries. Butane extraction is the oldest method available – it is also the dirtiest and most unstable. Some individuals try to use this approach at home, often with destructive – even deadly – results. In short, producers use heated butane as a solvent to dissolve plant matter while extracting the cannabinoids and terpenes. While this is effective and quite popular, it is also environmentally unfriendly and potentially toxic. Butane’s chemical nature means that small remnants of the solvent can easily remain behind. Common sense would dictate that this is harmful to a person’s health, especially for long-term users of THC drops. As a user, it is best to select an oil created through CO2 extraction. This is because the carbon dioxide process is newer and cleaner than the petroleum-based butane method. In order for the CO2 to properly dissolve the plant material and extract THC, it needs to reach a “supercritical” state. CO2 has a critical temperature of 31.10oC (87.98oF) and critical pressure of 1,071 psi. Once the carbon dioxide meets or exceeds these levels, it becomes supercritical, giving it both gas and liquid properties. In this state, the CO2 acts as a solvent, removing excess plant material while leaving the cannabinoids and terpenes intact. 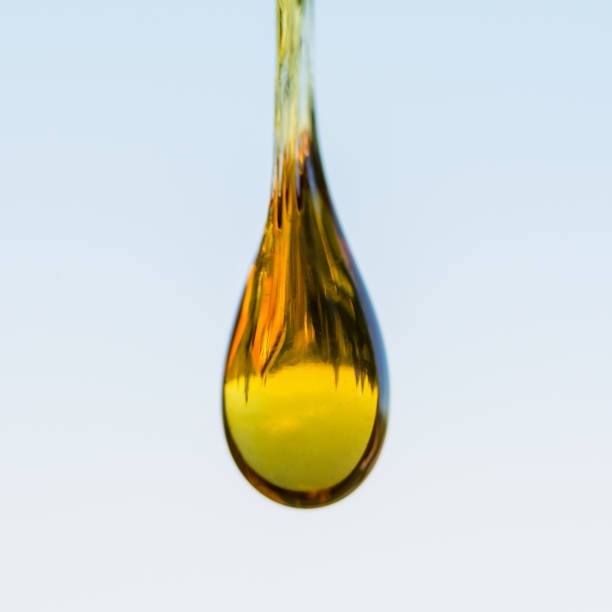 Once complete, the oily cannabinoids collect into a small container to then be placed into the manufacturer’s chosen carrier oil. The technical aspects of the process are quite complex. They require sophisticated, expensive industrial equipment and proper training. A third option is to make THC drops at home. Again, however, the end product will not nearly be as pure as its commercial counterparts; but when done properly, the oil will be decent and, ironically, still cleaner than the more complex butane option. Chefs start by grinding the cannabis, then placing it in a single layer on a baking sheet. After covering the cannabis in aluminum foil, they bake it at 220oF (104.4oC) for about 30 minutes. This allows heat to activate the THC – a process known as “decarboxylation”. Decarboxylated herb trades its green color for a light brown appearance. The final stage is to take the herb and place it in a saucepan over a stove, filled with enough oil to cover the plant material. Coconut oil is a good choice, but MCT is available online or at many health food stores as well. It is important to do this for at least 45 minutes, stirring regularly; however, many people continue the process for several hours to generate the best results. THC drops are very easy to use; however, it is important to note that these are strictly for oral consumption. The simplest way to use THC drops is through direct application in the mouth. Fortunately, the oil comes with a syringe, allowing users to measure the exact dose. This makes it easy for people to gradually work their way up to the right amount. Typically, 0.2 ml is a very safe starting point. Although everyone is different, many individuals find that 0.4 to 0.6 ml is a good range. Once in the mouth, try to hold it under the tongue for about 90 seconds. While this is not critical, it helps the oil absorb more quickly by initiating the process through the gums. When using drops for the first time, it is best to do so on an empty stomach. People who try it after eating often experience a delayed effect, leading them to use more before the previous dose has a chance to take effect. While THC overdoses are not dangerous, they can be quite unpleasant. 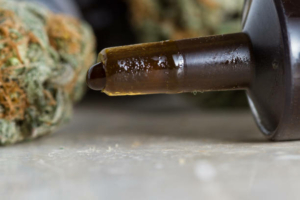 Some people may not enjoy the flavor of cannabis oil. Fortunately, they have the option to include it in common food recipes, such as pastries. However, it is highly recommended to exercise caution. Do not exceed the amount called for in the recipe. Not only will too much oil dramatically increase the food’s potency, but it also acts as a substitute for butter or regular oil. Using too much of any ingredient will effectively ruin the recipe. Alternately, users can simply add it on top of foods like salads or toast. “Start low and go slow” is mantra repeated throughout the cannabis world when it comes to edibles. The phrase is self-explanatory. The potency and longevity of THC drops make it essential to avoid an overdose. Again, 0.2 ml is too low to cause problems, so start there. Wait two hours and take more if needed. The process may seem tedious, but it certainly is better than the alternative. When purchasing THC drops, shopping for the right product is obviously essential; however, one particular thing to understand is the difference between full-spectrum and isolate. Full spectrum is arguably the better choice. What sets it apart is its terpene content. Terpenes are oily compounds found in a variety of different plants, cannabis being just one of them. Terpenes contribute to flavor, scent and – most importantly – effects. While terpenes may not be as important for recreational users, they are essential for medical recipients. Some terpenes specifically target conditions like anxiety, depression and epilepsy. The reason terpenes are so important is their role in the “entourage effect.” This is a synergistic relationship between cannabinoids and terpenes that contributes to therapeutic efficacy and potency. Without these critical puzzle pieces, users do not benefit as much as possible. Terpene profiles are easy to find. Simply check the product label, website or – if all else fails – contact the manufacturer directly. Cannabis Isolate is the opposite of full-spectrum. Put simply, the THC in these products stands alone. Terpenes are removed during the manufacturing process. While the THC will have an effect, the lack of an entourage effect reduces its potency. This does not mean that isolate is bad. Some people prefer the experience that isolate provides. Users report that isolate creates a very lucid and energetic high, as opposed to the cognitive impairment and euphoria associated with full-spectrum. 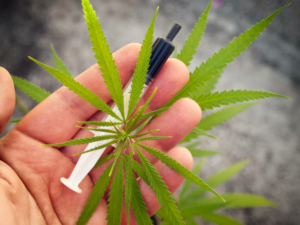 The included syringe definitely allows for accurate dosing of THC drops; however, it is always possible to take too much, either by underestimating the product’s effects or increasing the dose too quickly. While it is impossible to reverse the ingestion, users can still mitigate the effects in different ways. The effects of the THC drops will subside, but it could take several hours – much longer than with dry herb. If waiting it out is the only option, try to relax until sobriety returns. Of course, stay away from driving, operating heavy machinery or performing any tasks that require full physical and mental control. Sleeping is a great way to avoid dealing with the experience of an overdose. It also helps the body process and pass the THC naturally. It is still possible to wake up under the influence, but sleeping through part of it will at least alleviate some of the unpleasantness. 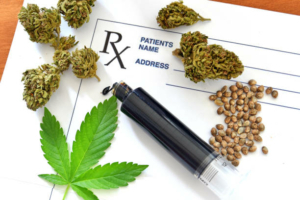 Cannabidiol (CBD) is a cannabinoid found primarily in hemp; however, medical distributors typically take indica or sativa strains and breed them to have high CBD content. Regardless of the source, CBD does not affect cognitive or motor skills. More importantly, it acts as an antagonist to THC. This means that it counters the cannabinoid’s effects, reducing the intensity and duration of the high. Ideally, it is best to use a dry herb CBD strain, since smoking creates virtually instantaneous effects. There are many reasons to try THC drops. Understanding the benefits will help users decide if this product is right for them. Like all edibles, THC drops appeal to non-smokers. Cannabis smoke may not be as dangerous as tobacco, but the burnt plant material does give off chemicals that can cause coughing, phlegm, and irritation. Drops bypass this issue entirely. Dry herb offers fast effects, but the high typically wears off within two to three hours. Edibles, on the other hand, can last up to 10 hours, depending on the potency and dosage. The increased longevity ensures consistent medical and recreational effects without using more product. THC drops are relatively discreet – more so than their herbal counterparts. The bottles do an excellent job of containing the cannabis aroma, but a simple spill could spread the scent and draw unwanted attention. Nonetheless, if all goes well, THC drops are unnoticeable, whereas smoking dry herb will leave a very distinct smell. All cannabis products have their shortcomings, and THC drops are no exception. Like their advantages, the drawbacks of drops are an essential component of making an informed purchase. Because THC drops take effect after digestion, users will not feel the impact very quickly. Although this may not be a huge problem for recreational users, medical recipients will not be able to get immediate relief when needed. Those with chronic issues will have to either anticipate the potential onset of symptoms, or take a consistent, low dose to keep a steady stream of THC in their systems. While some might disagree, many find the taste of cannabis to be far from palatable. The flavor also tends to linger in the mouth, which is why it is essential to have some sort of liquid on hand to wash it down. However, users can simply counter this by – as stated earlier – adding it to food or incorporating it in recipes.